She further called for Trump to hold direct talks with Kim Jong Un in order to prevent the real thing from ever happening. On Saturday Gabbard had immediately criticized President Trump for mishandling North Korea, taking to MSNBC to proclaim that “our leaders have failed us. Donald Trump is taking too long… he’s not taking this [nuclear] threat seriously…” During Sunday interviews she elaborated on a plan of action, advising Trump to enter talks with Pyongyang which should “happen without preconditions” and that Trump should “sit across the table from Kim Jong Un” in order stamp out the climate of fear which contributed to the “unacceptable” alert issued on Saturday. “We’ve got to get to the underlying issue here of why are the people of Hawaii and this country facing a nuclear threat coming from North Korea today, and what is this President doing urgently to eliminate that threat?” Gabbard said on CNN’s State of the Union. She added that Pyongyang sees its nuclear weapons program as “the only deterrent against the U.S. coming in and overthrowing their regime there” after decades of the US exhibiting a pattern of regime change when dealing with rogue states, which she said makes setting up preconditions for talks a self-defeating step. We know that North Korea has these nuclear weapons because they see how the United States in Libya for example guaranteed Gadaffi – ‘we’re not going to go after you, you should get rid of your nuclear weapons.’ He did, then we went and led an attack that toppled Gaddafi, launching Libya into chaos that we are still seeing the results of today. North Korea sees what we did in Iraq with Saddam Hussein, with those false reports of weapons of mass destruction. And now seeing in Iran how President Trump is decertifying a nuclear deal that prevented Iran from developing their nuclear weapons, threatening the very existence and the agreement that was made. At this point an incredulous Stephanopoulos stopped the Congresswoman and asked, “Was it a mistake for the United States to take out Gaddafi and Hussein?” Gabbard responded firmly with, “It was, absolutely.” Apparently this was enough to end the interview as a presumably shocked Stephanopoulos had no response at that point. 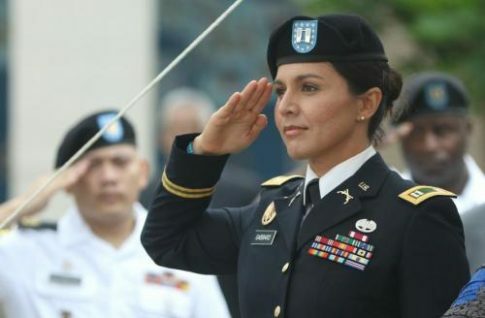 For those unfamiliar, Gabbard is an Army reserve officer who previously served two tours in the Middle East, including in Iraq, and has been an outspoken critic of regime change and Washington’s interventionist foreign policy.